Today is half price day over at the local Salvation Army and word really must be out because we had to loop all the way around the back to park. Not that it’s a huge parking lot or anything. The store just never seems to be that busy. Today was the exception and I thought we might get run over while looking for cool furniture pieces by the heavy-lifters taking things out to packed cars. Everything I had been dreaming of owning was gone, but as I learned before I really need to “buy when I spy” or it will be gone. Since the place was getting a good clean-out this morning I decided I should probably just see what books were still available for the Little Guy and then skedaddle. We will have to start arriving right at opening time on Half Price Wednesday, I guess. Today was not a total loss, though. I did score another cute wall basket that I think I will pair with the round one I got a few weeks ago and put both up by our garden tub in the master bath. The Little Guy only managed to find one book of interest and I think his interest was only piqued because there is an alligator head at the top, and it snaps when you push down on a lever. Whoa- high tech! He played with it the whole time we walked around and stood in line, which means he was happy for $.25. Yeah! 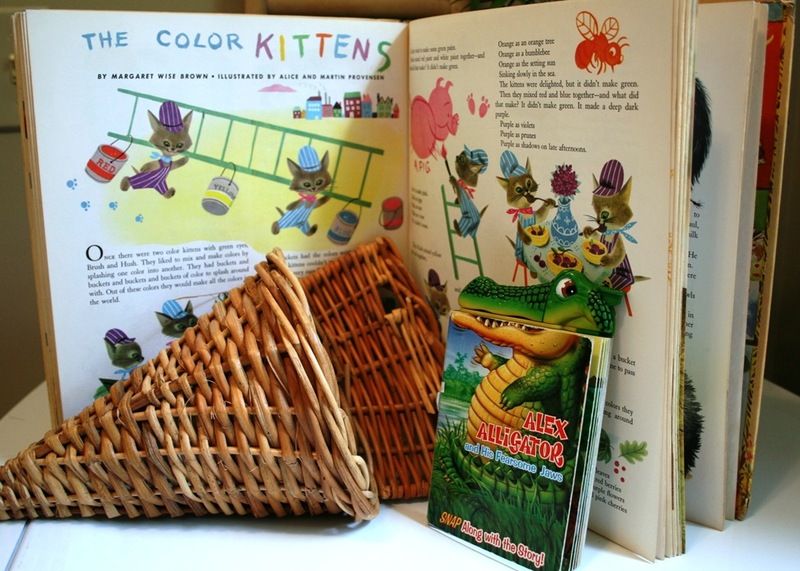 I did grab a Little Golden Books Treasury because the images are great. 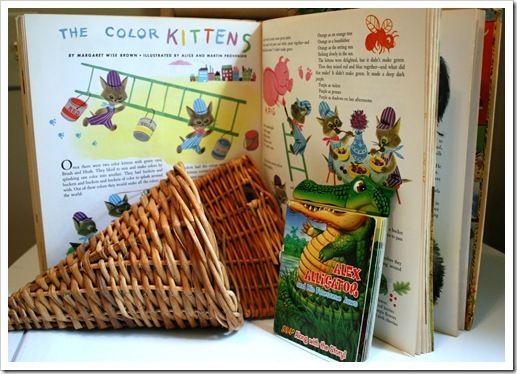 Our experience so far with the Little Golden Books is mixed reviews. He has two books with three classic stories each, but only wants to read one of them. The other regularly gets thrown in the toy box and buried. I guess I just don’t remember the stories being so sappy and lame. Every time I read one I think, “Man, this is bad. Really bad.” So, I guess I can’t blame him. Maybe I just bought the wrong ones so far.? I plan to let him look through the colossal treasury to find out if he wants to get to the reading part. We will just have to see. I haven't found anything worth buying at my local thrifts in ages! There is a little antique shop that I find some cute vintage fabrics in from time to time, but mostly, I'm only buying at flea markets.